Check for updates at launch: Set iCash to look for new versions at start-up. Transaction Auto-Completion: Activate/deactivate transaction auto-completion. 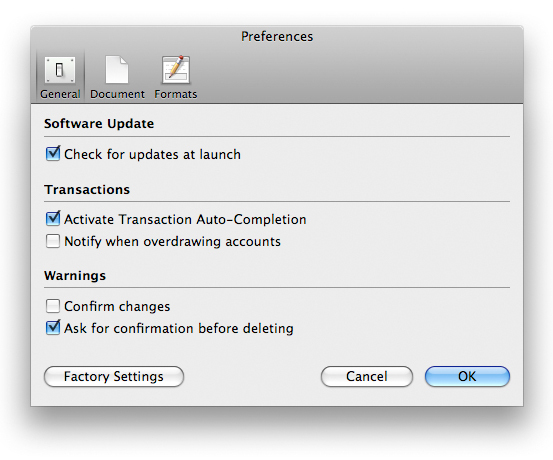 Account overdraw notification: Activate this option to get notified when overdrawing an account. Change confirmation: Activate this option to be asked for a confirmation when editing an entry. Deletion confirmation: Activate this option to be asked for a confirmation when deleting an entry. Balance display in title: Select the account which balance will be displayed in the document status bar. Number format: Set number format, thousand separator, currency, decimals number and currency position.